Welcome to 1st for Brittany Property – home to properties in Brittany! 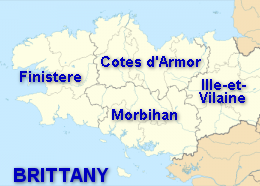 Brittany is located in the North West of France and is made up of the 4 departments of Finistere, Morbihan, Cotes D’Armor and Ille et Vilaine. The region offers an enchanting mix of old medieval towns and quaint villages. There are kilometers of unspoilt sandy beaches giving way to rugged cliffs with the “Pink Granite” coastline looking like the backdrop for a film set. This is a land of magic, mystery and legends, and it is alive with the music and dance of the Breton culture and retains many of it’s old Celtic traditions. The Broceliande forest having links to the legend of Merlin and King Arthur. The spectacular Lac de Geurledan is located in the centre of Brittany with kilometers of walks, canoe and kayaking and even a beach area. With rolling hills and lakes it is difficult to resist the charm that Brittany has to offer. It’s ease of access from the UK, with daily flights to the airports of Dinard and Brest and ferry crossings to St Malo and Roscoff, makes Brittany an ideal location whether you are looking for a holiday home or to make a permanent move. Looking for a Brittany Property? We will be delighted to help you find a Brittany property in this popular region of France.